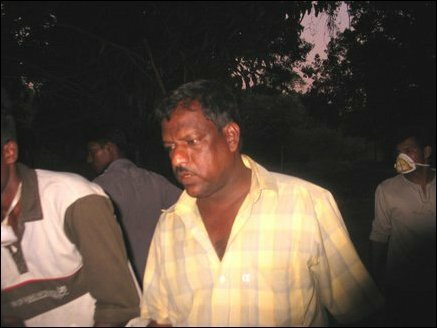 “There is nothing left standing along the entire stretch from Mullaithivu to Vadamaradchi east. 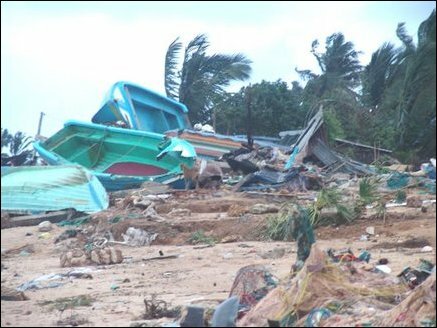 The devastation is total on the coast and its hinterland from 800 metres to 1.2 kilometres from the shore. 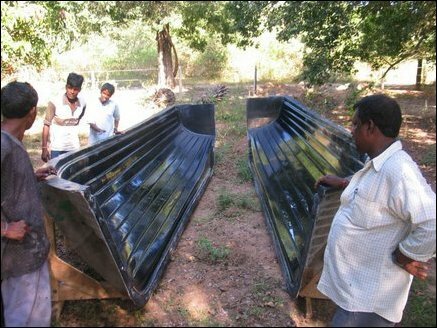 Boats and fishing gear of the thousands of families that rely on the sea for their livelihood are gone,” said a official of LTTE peace secretariat after the 26th Tsunami. 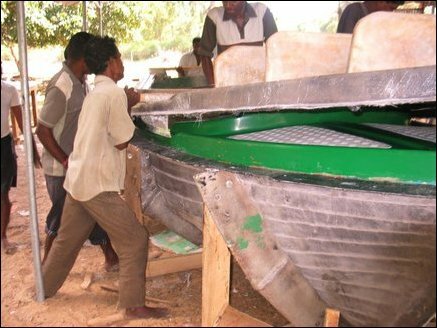 It made sense to utilize the latent skills within NorthEast to urgently revitalize the boat building industry. Rajadurai Kengarayan worked at the Thopukkadu boat yard run by the CeyNor in Karainagar during 1959 to 1982. He ran his own boat business after 1982. TECH wooed him and he agreed to the challenge to turn the new boat yard into a successful manufacturing facility. Building large trawlers and pleasure boats are in the drawing board. Start from a known design. Modify structure to suit the new shape and form. Extending and widening the size, adding cosmetic changes are done to the "master" boat. 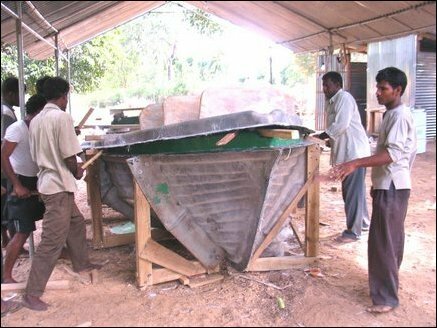 Master boat is used to build the mold for production. 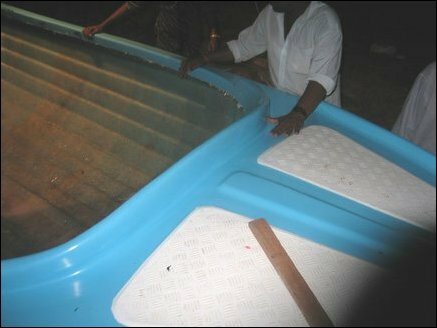 Same fiber glass mats and polyester resin, catalyst are used to build multiple layers of fiber mat to build the mold. Typically eight layers are used. 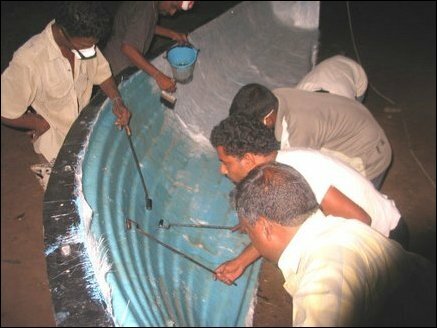 Pigment Paste (black) and gel coate allows the separation of the mold from the body of the master boat. 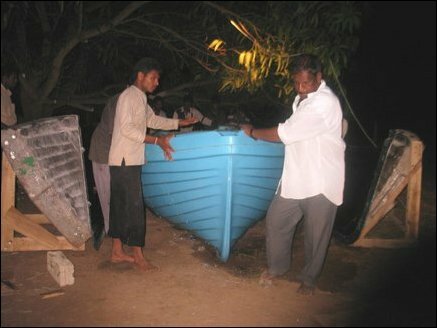 The mold, in two large pieces, can be used to produce several boats, if used carefully according to the master craftsman. 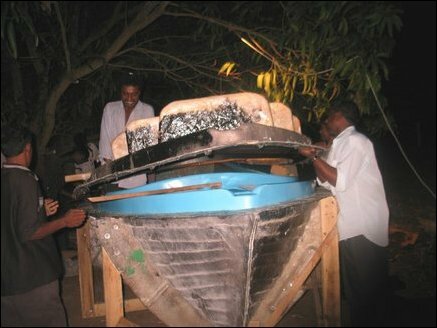 One half of the mold separates from the body of the master boat. 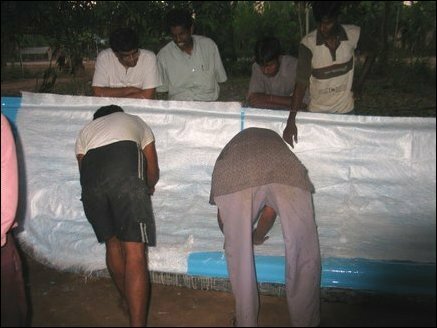 Workers inspecting the main molds after the fiber glass layers are allowed to dry for up to 12 hours. 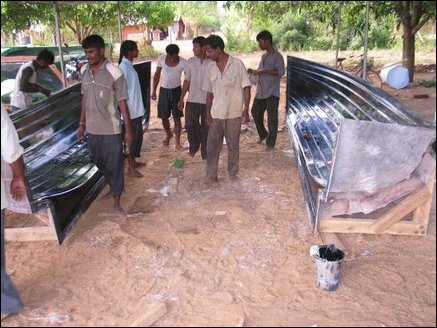 Molds for both halves of the main body is ready to be used to manufacture new boats. 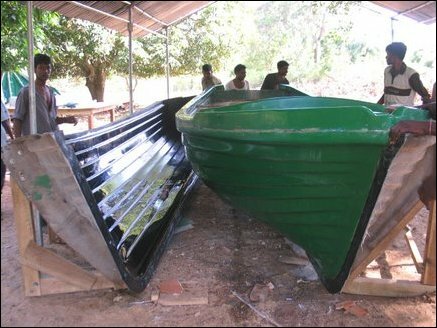 Rangarayan assures that building two halves of the body and finally fusing them together gives as strong a boat as if the mold itself is fused and the new boat is made as a single unit. Layering for the first new boat begins. The thick blue color on the mold serves as a separator as well as provides the color to the new boat. Four layers of fiber glass mat and resin/catalyst coating makes up the main body of the new boat. Four layers are manually constructed for the second half of the main body. Layers are manually pressed to form close contact with the surface of the mold. The two halves are tied together tightly and several layers of hardening compound including cement is used to fuse both halves. 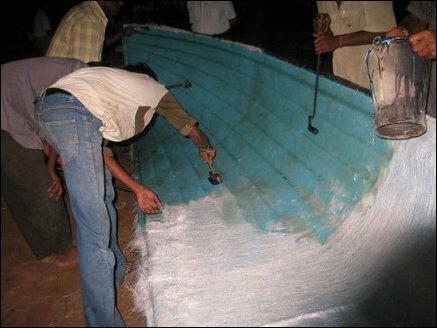 Mold is then separated leaving the sea-blue outer coating of the new boat left intact with the new body. The fiberglass body of the new boat requires additional timber fittings for seats, accessories to connect outboard motor, and reinforcement fittings inside. Two-person day worth of effort still remains. 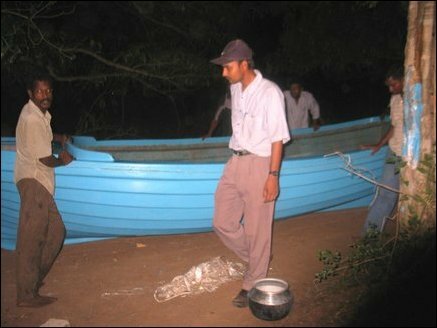 New boat being moved to a separate location for the additional inside work. Original top part of the mold contains fittings to provide non-slippery surface at the front of the boat. 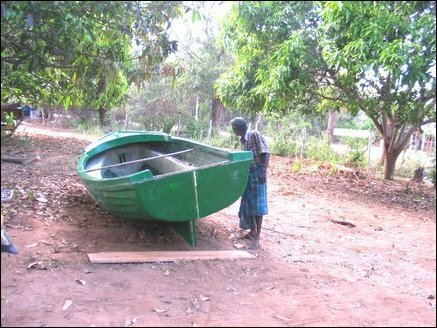 ArulMoli, part of the workforce, says that she can easily handle the physical work that is expected of any male worker in the boat yard. 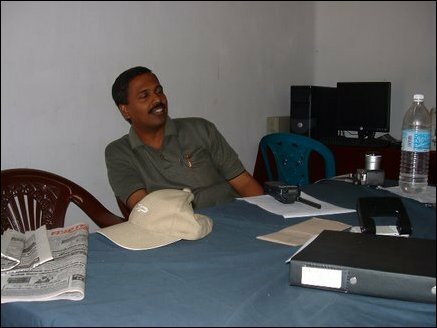 Sivalingam Suhunan, Executive Director of the Economic Consultancy House (TECH) which has undertaken the boat yard venture with funding from a UK-based expatriate organization, says he is pleased and surprised with the progress made so far. He encourages experienced technologists from the expatriate community to invest in similar economic ventures that can bring immediate benefit to the war and tsunami affected people in the NorthEast.